The hills of Mad River Glen, in northern Vermont. In the natural wonderland of the state's northern forests, a novice to the pastime finds a whole new reason to love winter in New England. "You have to strut!” my girlfriend, Michelle, hollered at me from the bottom of the hill, pointing at her hips and waving her ski poles around. How had she gotten down there so quickly? We were deep in Vermont’s snowbound woods, on a mountain at Mad River Glen. Everything was white and icy, all slumbering trees and prehistoric boulders. The only sound consisted of a rusty leaf rattling between two branches—and our voices echoing through the frosty air. “Strut?” I yelled back, still trying to get the hang of going downhill on the tech-y, lightweight aluminum snowshoes we’d rented. “Like a model on a catwalk,” she said, shimmying encouragingly. Easy for her to say, radiating glamour in her Jackie O. sunglasses. The only way I could figure out how to descend the hillside was to let the tail end of the frame touch down first, then slide forward until the crampons—the fanged grip on the snowshoes’ bottom—kicked in and provided some traction. This lurching method meant I had to lean back while executing high, wide knee lifts, resulting in a form that wasn’t so much Gigi Hadid as Robert Crumb’s Keep on Truckin’ character—wearing snow pants. Natural though I wasn’t, I still loved my first grown-up snowshoeing hike. As soon as we set off on the Mad River Glen trail, we were immediately ensconced in the Vermont wilderness. To snowshoe is to experience the landscape from within in a way you never can when you’re zooming down groomed slopes, or even bushwhacking off-trail. A snowshoer is simply one with the elements, tramping through the frozen countryside in a state of calm exhilaration. You can’t really hear over the crunching of the snow, so unless you stop to communicate, you are essentially alone with your thoughts. Within a few minutes, all your senses start collapsing into one another, into a single, trilling sensation of tranquillity. Pretty soon, you find yourself wondering whether there is any greater sense of peace than that found perambulating over hills and meadows blanketed in snow. The view from Common Road in Waitsfield, Vermont, with Mad River Glen in the distance. This mellowness only applies when the terrain is flat, however. Once you get into hill country, it becomes an actual workout: like being on an elliptical machine, but a great deal more inspiring. Snowshoeing up an incline isn’t too different from walking on tiptoe, Michelle said, an insight that helped me immediately. But when we hit that first steep gradient, and my ineptitude became laughably apparent, I started to doubt whether I had what it takes to become a real uphill-downhill snowshoe kind of person. It doesn’t matter that I grew up skiing with my family, or that I used to love snowboarding as a teenager. My participation in winter sports has gradually dwindled to a token game of ice hockey on an outdoor rink every year or two. My long-standing strategy for dealing with the frigid months in Montreal, where I live, can be summed up in a single word: avoidance. I’m not alone: most of my friends also consider winter an ice-cloaked evil from which to escape. Unfortunately, it snows for half the year in French Canada. Some consider Quebec the Siberia of North America: a permafrostencrusted realm of primordial cold and darkness epitomized by a classic folk song declaring “Mon pays, ce n’est pas un pays, c’est l’hiver”—my country isn’t a country, it’s winter. Ideal for Under Armour–wearing winter-activity nuts, but not really for anyone else. Certainly not for people like Michelle and me, whose idea of embracing the cold involves gluing ourselves to the fireplace, cooking French food, and deepening our expertise in the wines of Burgundy. Every winter, I remind myself that the Canadian dream isn’t about becoming rich or successful; it’s about finding a way to be in the tropics in February. “Because,” I explained, scrambling up an eight-foot snowbank to cross the street, “not being able to go for a walk feels like surrender. We can’t keep letting winter win. We walk to the restaurant in the summer, don’t we? A little windchill shouldn’t change that.” She ignored my outstretched hand and requested an Uber. “Nobody goes for a city walk in winter,” she retorted. "Can't we just go snowshoeing?" I hadn't been snowshoeing since I was a child. In fact, I had no idea that people actually went on snowshoeing expeditions, let alone that snowshoe technology had evolved from the wooden, tennis-racketlike, beaver-tailed objects of my childhood. But I learned all that a few days later, when my younger brother posted some photos of himself and his wife wearing futuristic aluminum contraptions over their winter boots somewhere in the Rocky Mountains. Inside the Pitcher Inn, in Warren. To prepare, I checked out snowshoemag.com, which covers everything you could possibly want to know before getting started, including a list of snowshoeing clubs across the country. 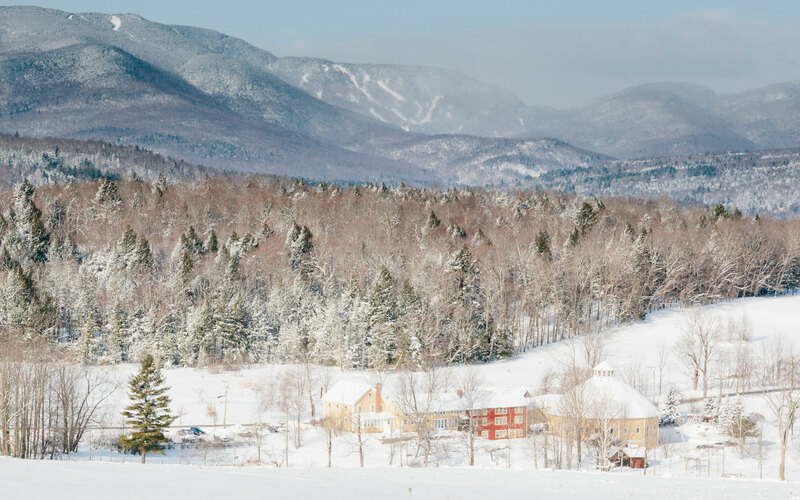 An article on the site, “First-Timer’s Guide to Snowshoeing,” provided a list of the best places to experience “the world’s fastest-growing winter sport,” and the first destination it mentioned was Vermont, a two-hour drive away. I go there often to visit family and friends, to enjoy the leaves changing color in autumn, and to explore swimming holes on summertime day trips. Midway through the tour, we stopped in at an old sugarhouse for hot cider and local Cabot cheddar cheese with pepperoni. Aboriginal deer-hide snowshoes were mounted on the wall, a reminder that this tradition dates back to long before Europeans arrived in the New World. In earlier times, snowshoes weren’t for recreation—they were a vital means of transportation in an era when there were no roads. Using them today not only connects us to the land, but to a sense of its past, as well. Having warmed our insides, we headed back out into the cold night. It was a strange, new feeling to be out there at such an unlikely hour and time of year: a combination of runner’s-high-like elation, magnified by the sedentary urbanite’s sense of accomplishment at having participated in the natural world during wintertime. The wind picked up, causing the shadows cast by the spindly, creaking trees to take on an otherworldly quality. Michelle gazed up at the starry firmament and marveled at the extent of its brightness, so far from light pollution and civilization. An infinite universe of stars above lit up the path as we made our way slowly, happily, through the snowy February night. 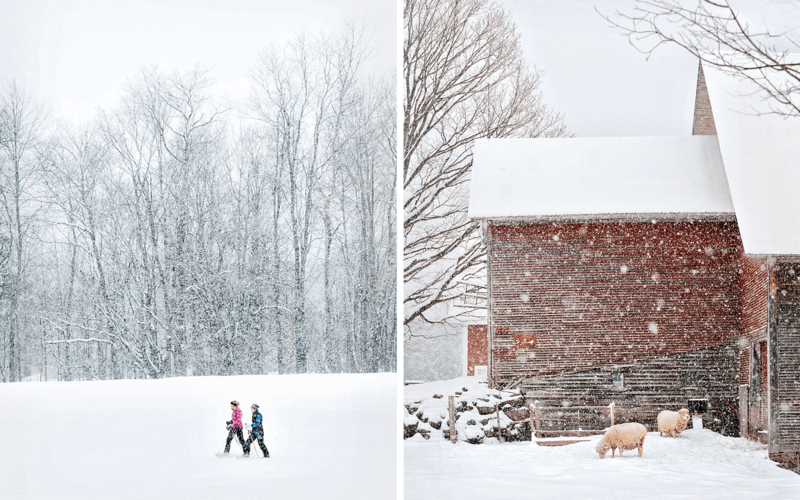 Left: Snowshoeing through fresh powder in the Mad River Valley. Right: A backcountry farm in the Mad River Valley. If you’ve never gone snowshoeing before, try a beginner trail at one of Vermont’s ski resorts. Stowe, Sugarbush, and Jay Peak all cater to snowshoers, but our favorite is the down-home Mad River Glen. All you need is warm outerwear and comfortable winter boots—rental shops will set you up with snowshoes and ski poles. To venture deeper into the wilderness, or to go on a nighttime hike, hire an expert guide from Umiak Outdoor Outfitters, in Stowe, or Ole’s Cross-Country Center (olesxc.com), in Warren. The Pitcher Inn is a Civil War–era Relais & Châteaux property in the town of Warren. Everything here is excellent, from the restaurant’s wine list to the hand-cut, Vermont-made Stave puzzles in the library. 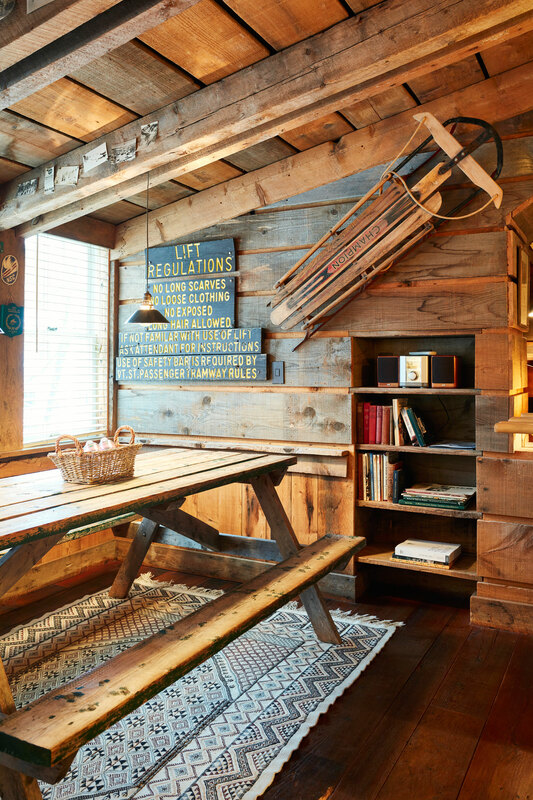 Try to book the Mountain Room, which has a lovely fireplace, as well as a steam shower and heirloom snowshoes on the wall (pitcherinn.com; doubles from $375). Vermont produces some outstanding beer (names to look for include Heady Topper and Hill Farmstead) and pizza, and American Flatbread at Lareau Farm highlights the best of both.